I have been wanting to try and make biscotti for a while now, ever since seeing Yasmin Limbert's chocolate pistachio variety on the Great British Bake Off. And these little Christmas delights seemed like the perfect addition to make a nice Christmas biscotti. So as soon as my Hotel Chocolat parcel arrived I headed for the kitchen to bake up a storm. OK, well maybe I sat on the sofa and ate a handful first, you know, quality control and all that! 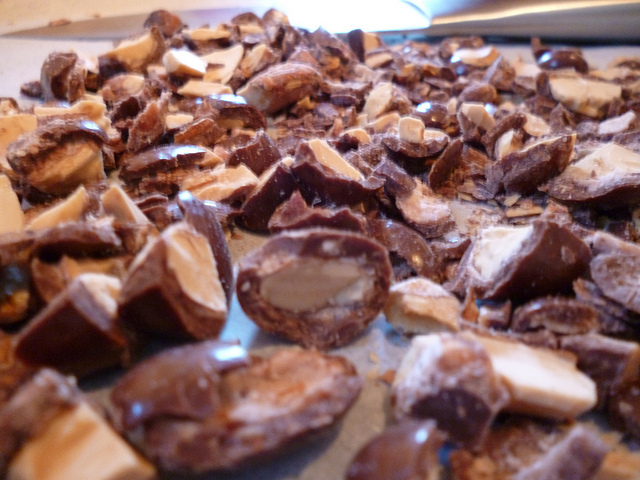 60g Hotel Chocolat Almonds roughly chopped. 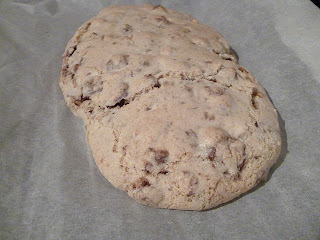 The method I used slightly differs from Yasmin's, my first attempt to make them went horribly wrong, it was all the BBC's fault as they changed her recipe on their website so no matter how hard I tried it just wouldn't form a dough! Thanks to the Lovely Urvashi on twitter I managed to salvage it and get some pretty delicious results. I then combined the sugar, egg and almond flavouring and whisking using an electric whisk until the mixture was light and well combined. I then added the flour, baking powder and chopped nuts and formed a sticky looking dough. 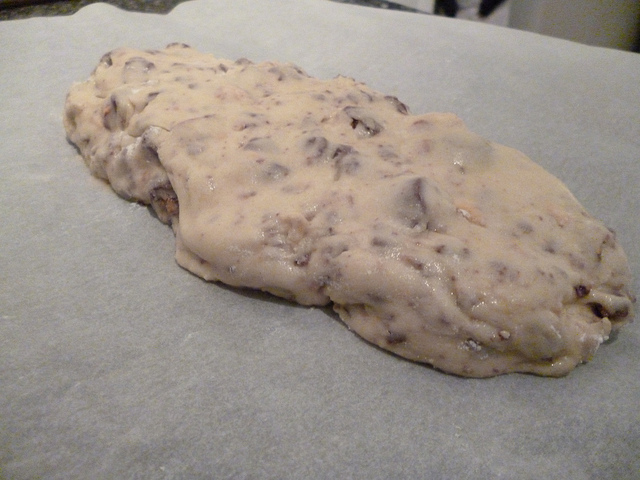 With well floured hands I then plonked the dough onto a lined baking tray and smooshed it into a long log shape. I baked at 180 for around 25 minutes, until lightly browned. 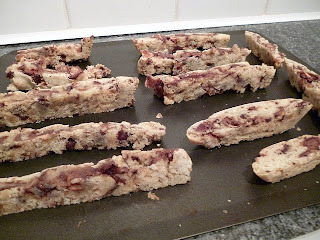 I then allowed it to cool completely (this is important as it is much easier to cut when cool) and cut horizontally to make the traditional biscotti shape. They then baked again for 7 minutes, then were flipped over and baked for another 7 minutes. It may seem faffy in places but it is honestly incredibly easy and they make fantastic edible homemade Christmas gifts, just pop them in a cellophane bag and tie with a nice Christmassy ribbon! 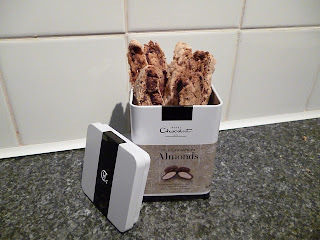 The Hotel Chocolat Milk Chocolate Cinnamon Almonds really are incredibly versatile, on their own they are like little pieces of pure christmas. The chocolate is of course the usual high quality you'd expect from Hotel Chocolat, The cinnamon isn't too overpowering but a nice subtle hint and the almond has a great roasted flavour and good crunch. I will definitely be buying these again, they are £10 for 250g and they come in a really nice tin which I am now re-using to keep tea bags in at work! 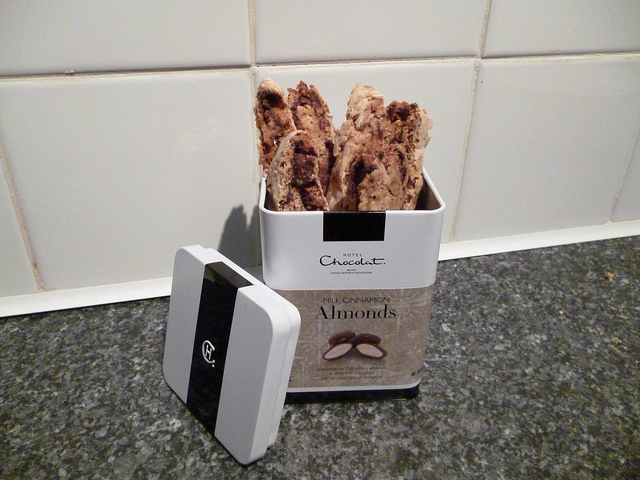 Now for the part you have all been waiting for: Hotel Chocolat are offering a 250g tin of chocolate cinnamon almonds worth £10 for one very lucky reader. 1. Visit the Hotel Chocolat Christmas Page and leave a comment below telling me which product you would like to find under the tree on Christmas Day. 3. For an extra cheeky entry Follow Nellyscupcakes on Twitter and you know the score, leave a comment letting me know (include your twitter name). Update: Sorry, competition is now closed! Looooooove hotel Chocolat, so I'd want anything and everything under the tree!! But think one of tge advent calendars or a Dasher the reindeer for Bubba (my wee man Archie) to enjoy would be fab!! Thank you for this lovely giveaway my dear very generous of you! Realistically, I am likely to find my 3 legged cat Percy eating the ribbon off our gifts, haha! I love cinnamon, almonds, and chocolate!! Combined sounds heavenly! 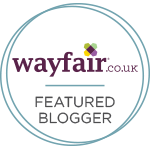 Too hard to choose just one thing on their site but I want to try the Winter Desserts! I like your facebook page now! Everytime I look on hotel chocolat I want something different! Today I'm feeling the Christmas Bliss gift bag. 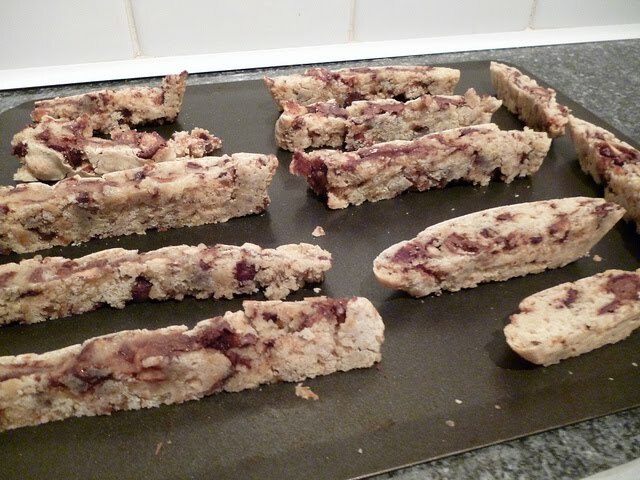 Ps Love your biscotti and your inventive use of the product! I love Hotel Chocolat. There store in Chester is so lovely. I think the winter desserts so yummy! Ok I have liked your facebook book page, twitted and follow you! Trying to enter but the link for the Hotel chocolat christmas page isn't working? 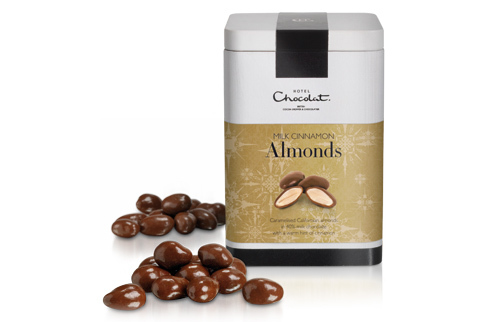 Great giveaway - chocolate cinnamon almonds sound amazing! I would very much like to see the Turkish Delight (http://www.hotelchocolat.co.uk/turkish-delight-P330027/) under my tree, I do love chocolate, but I especially love turkish delight. I follow you on twitter and facebook and I have tweeted the phrase! whoops re last comment I forgot to add my twitter name! Damn blogger posting before I was finished. I adore those wee caramel penguins. How cute are they? I would love to find some tiddly caramel chocolate penguins under my tree! Sweet and delicious! I would like to find the alternative mince pies, they look & sound really really tasty! I would be more than happy with some Hotel Chocolart under my tree! I love the little reindeers! 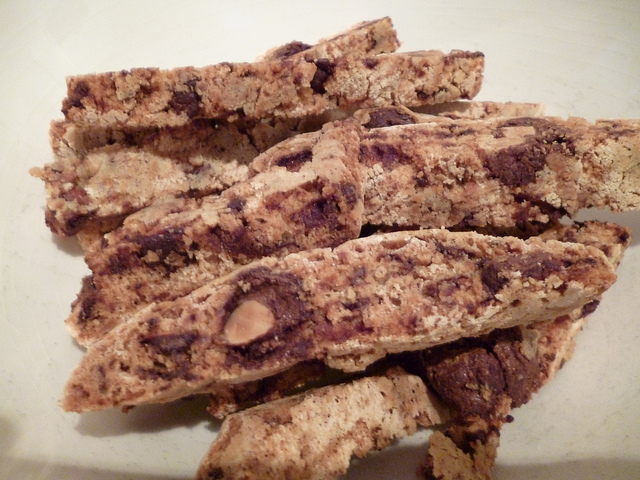 PS i will have to try the Biscotti at the weekend! Tiddly caramel penguins - sooooo cute! I would love to win the class Christmas selection, they look gorgeous. I'd love to find the alternative mince pies under the tree, they look yummy. 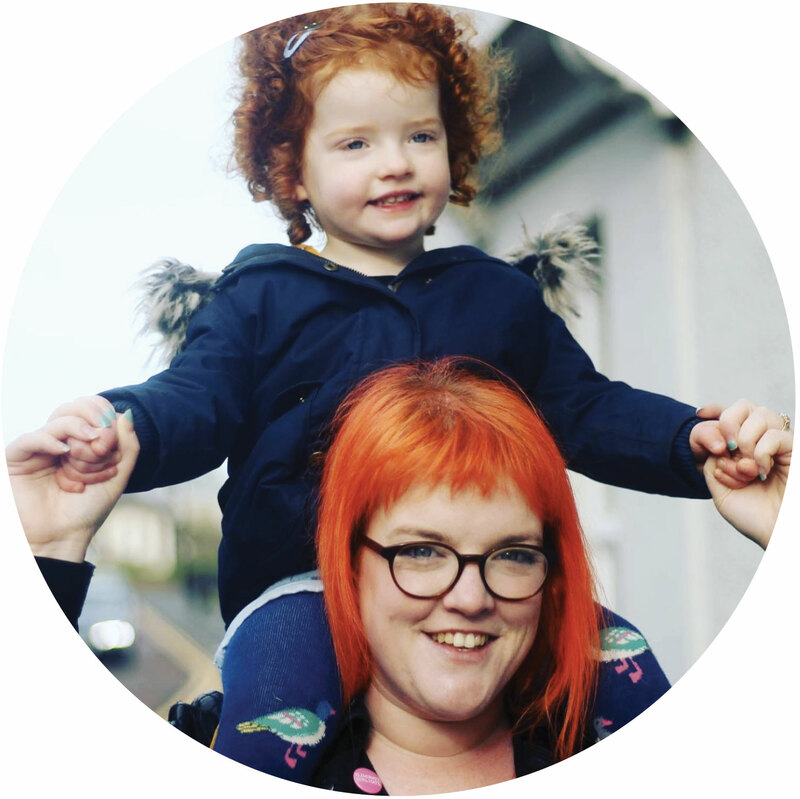 I'm also following Nellys Cupcakes on facebook - yummy! I would love to find Hotel Chocolat's Alternative Mince Pies under my Christmas tree, they look amazing. I love the table crackers would love these on my table! I'm now following you on FB. follower 70. I would love to fing the chilli penguins under my tree. Those cinnamon almonds sound delicious, may have to go and buy some.